Stephen Davies: The interesting thing about Cosmopolitan Dock – unique in HK and quite uncommon elsewhere – is that it was designed from the outset as two docks in one; an inner and an outer. The dock had a fat, slightly shorter outer part (212 x 100 feet) and a slightly narrower, slightly longer inner part (234 x 83 feet – measurements overall length and width at top). 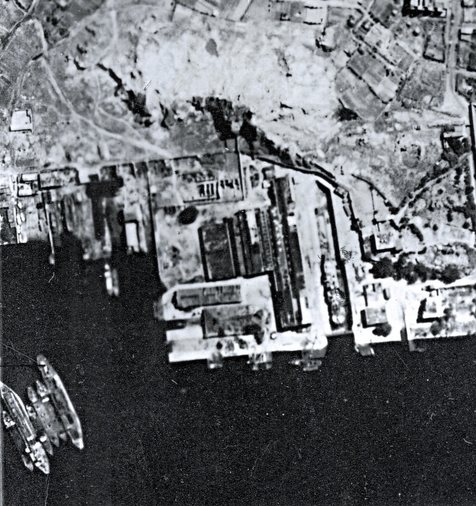 You can see this clearly in this 1945 aerial photo. That meant that it could accommodate two ships, though the plan rather required that the yard managers knew how long any repairs would take, so that they always had the long term job in the inner dock and the shorter term jobs in the outer dock. Alternatively, the whole could be used as a single dock, though the beam of the larger vessel was always constrained by the beam limits of the inner dock. These sorts of graving dock (the technically correct term) are quite unusual. 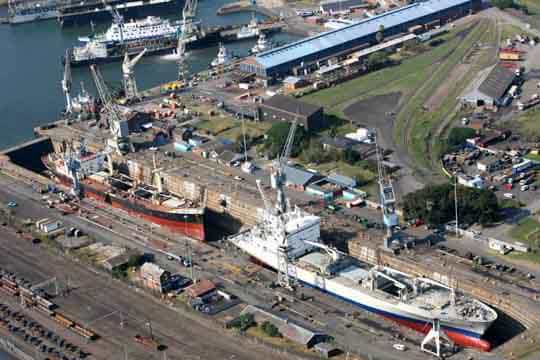 The Prince Edward Graving Dock, shown below, in Durban, South Africa, completed in 1925, has the same conformity. The earliest I have found that has the same design is a double inner/outer dock built in Mumbai (Bombay) in 1807 for the RN, the inner for building ships, the outer for repair (H.V. Bowen, Margarette Lincoln & Nigel Rigby (eds), The world’s of the East India Company, Woodbridge: Boydell Press, 2002, Andrew Lambert, “Strategy, policy & shipbuilding: the Bombay Dockyard, the Indian Navy and Imperial security in eastern seas, 1784-1889”, pp.137-151). I don’t know when that was taken out of commission, but it wasn’t until 1950 that the same pattern was followed again for the present day Hughes Dock there. This article was first posted on 16th March 2015.